There is some controversy over the use of Martlets to represent the Arms of Edward the Confessor. Early representations of his Arms clearly show birds with feet and claws, and are probably Doves. Many Parish and Urban District Councils within the former bounds of the Forest of Essex had blazons which reflected their Forest links. Royalty, the Church, Deer, Trees and Rivers were incorporated in their Arms. Ilford, Wanstead & Woodford and Chingford are prime examples. The local Scouts have included local forest connections into their District badges. Following the creation of the London Boroughs in 1964 the London Borough of Redbridge was formed mainly from the amalgamation of Ilford with Wanstead & Woodford Councils. 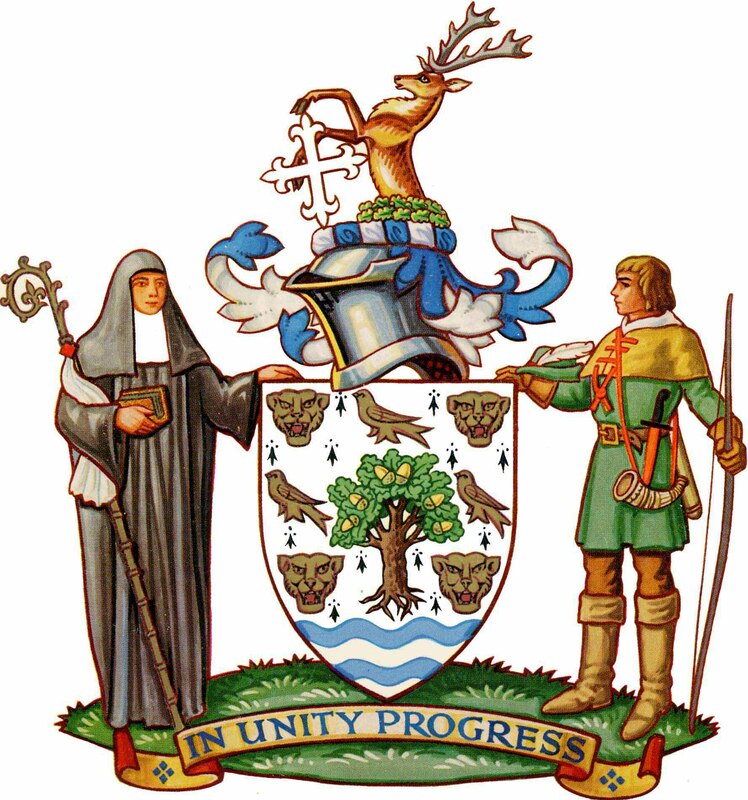 The Grant of Arms incorporated much of the heraldry of the earlier ones, and with the Supporters, gives pointers to the history of the Forest of Essex, of which Hainault was a part. The Supporters show a Forester, and a Benedictine Abbess. The Abbey at Barking owned 3000 acres of woodland at Hainault and occasional Royal licenses from the King allowed the taking of timber for building and heating. Following the Dissolution the woodland became the property of Henry VIII who carried out an inventory in 1544. The woodland became known as Kingswood. On the shield are Leopards faces which are from the Arms of King Harold showing association with Waltham Abbey, and the Martlets with Edward the Confessor. There is some controversy over the use of Martlets, as early representations of the Confessor's Arms clearly show birds with feet and claws. These were thought to be Doves. The Oak Tree (fructed and eradicated) represents The Fairlop Oak which was said to have stood there "halfway up from the dawn of Christianity", was certainly a tree of great antiquity. The wavy blue and white lines (wavy barry wavy azure and argent) depict the River Roding which flowed through the ancient Forest and separated Waltham and Hainault Forests. The helmet is that of an Esquire, used for Corporate bodies. The mantling azure and argent reflects the colours of the River Roding. The Crest shows a demi-buck - a Fallow deer, many of which were of a dark form thought to have been introduced by James I in 1610. A herd is kept by The Conservators of Epping Forest in a sanctuary at Birch Hall, Theydon Bois, Essex. The buck is holding a Cross flory which is for Westminster Abbey which held lands at Wanstead and Woodford. The Caplet of Oak leaves completes the Crest and represents the large numbers of Oaks which were present in the Forest. An issue of "LOOK NORTH", newsletter of the Ilford North Scout Council (May 2000) explains the design on the District badge which has been in use0ince November 1972. "In Tudor times, Commoners who wished to graze their cattle on Royal lands, such as Hainault and Epping Forests, were required to brand their cattle with the letter K surmounted by the crown, depicting Royalty. This brand covered the area of Barkingside and surrounding districts, and was still in use up to 1880. After many years of use the brand was worn down to that depicted on the badge. The Skin represents the place where they were treated and named Tanners Lane, where the District, at one time, had their Headquarters. The gold background represents the money that changed hands at the annual Fairlop Oak Fair which was held at the FAIRLOP OAK, Barkingside, the theme being barges and shipping." The badge was researched and designed by two former Assistant District Commissioners of Ilford North District, Peter Miles and John de Boer.